Stagecoach South West is supporting St Luke’s Hospice Plymouth to raise awareness and fundraise. 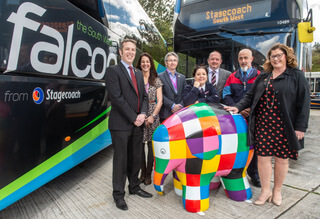 The charity provides support and care for people with life-limiting illnesses, announced Stagecoach South West as the Presenting Partner for Elmer’s Big Parade Plymouth. An estimated 40 elephants, all with their own unique design painted by local artists will attract 250,000 visitors, who will explore the charity sculpture trail. The charity used Elmer the elephant, a character from the beloved children’s book, for the outdoor trail. Bob Dennison, Managing Director of Stagecoach South West, said: “We are thrilled to be Presenting Partner and supporting such a wonderful charity. We will be working to help raise awareness of Elmer’s Big Parade Plymouth and the incredible work done by St Luke’s, and of course help raise vital funds. “We work to support a range of local community causes in the South West; the very communities we help bring together through our local bus services. The finale of the parade will be an auction of the elephant sculptures, allowing the charity to continue its care for patients at home, in hospital and at its specialist unit at Turnchapel.